In this post, we will cover everything about the streams management in the webinar room. If you feel lost in the webinar room, this is a good place to start. Once your webinar is published, you can go to the webinar room. 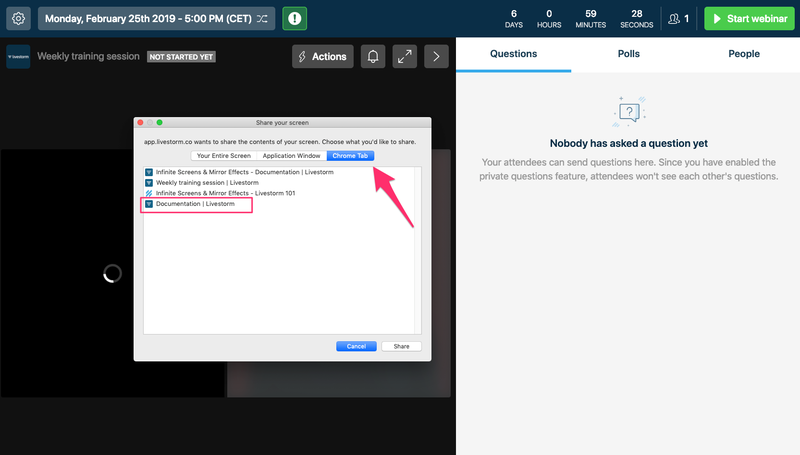 Just click on " Access webinar room" at the top of your webinar dashboard. First, let's look at the top of your webinar room. As explained in this post, contributors can join the webinar room before it starts. Attendees won't be able to enter the room until you click on the green "Start webinar" button. If they try to enter the room before, they'll be redirected to a waiting page waiting for the webinar to start. Note the label "Not started yet". This label indicates the current state of the webinar room. When you have the "Not started yet" label you are in what we call a green room. A preparation room if you prefer. 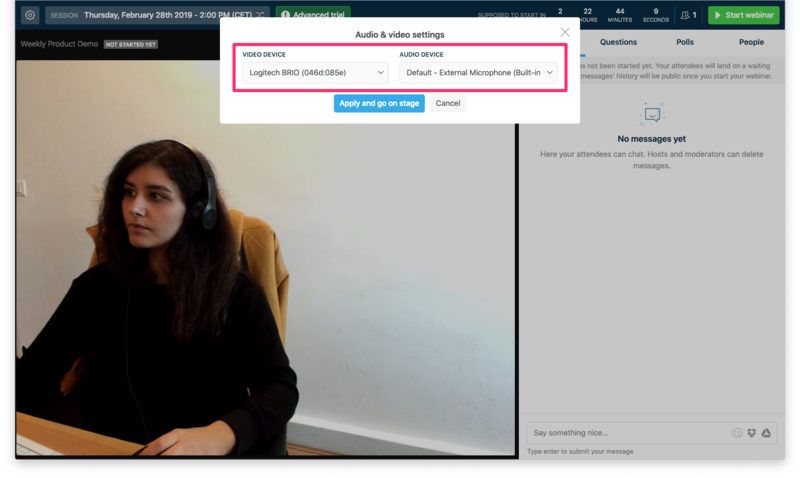 The "Live" label indicates that you are streaming live and your webinar is getting recorded. 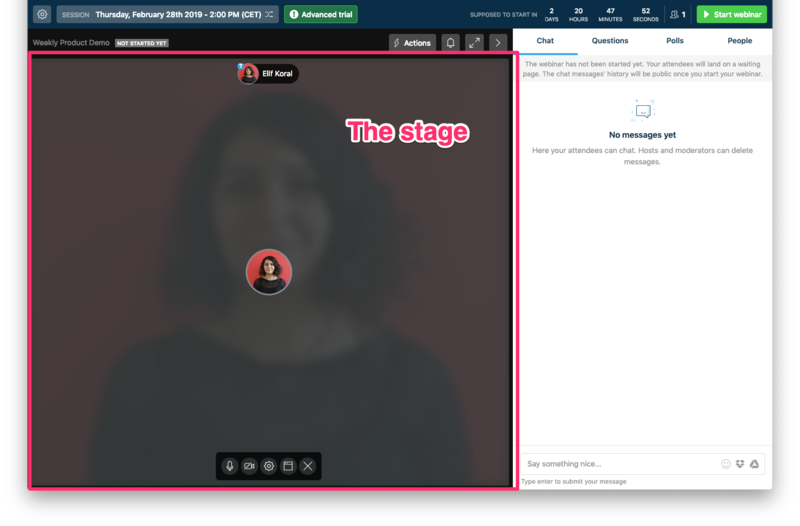 If you're on stage, everybody in the webinar room can see you or hear you. 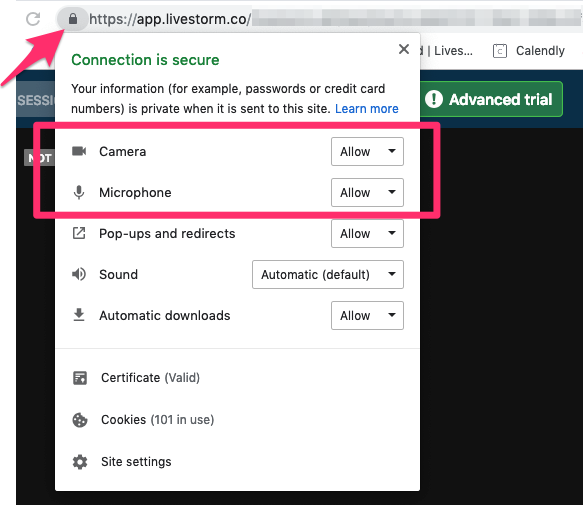 When you join in the webinar room for the very first time, you will have to allow your browser to access to your webcam and microphone. You can configure your settings before going on stage. 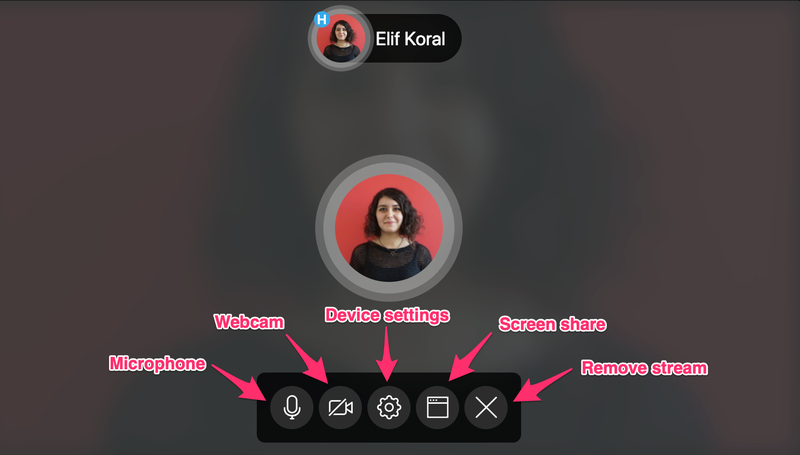 You can share your webcam (or disable it) and your microphone. If you'd like to use an external device (for example an external USB microphone or webcam), this is also where you'd choose it. Watch the green bar on the side to see if there's any sound captured. Next time you enter the room we will keep the same settings. If you want to change those settings just click on the gear icon (in the middle of the Dock). If you close this window by mistake, don't worry. You can always go back on stage by clicking the green " Go on stage" button. Once you've configured your audio / video click "Apply and go on stage". Once you're on stage, you'll be seen and heard by everyone. 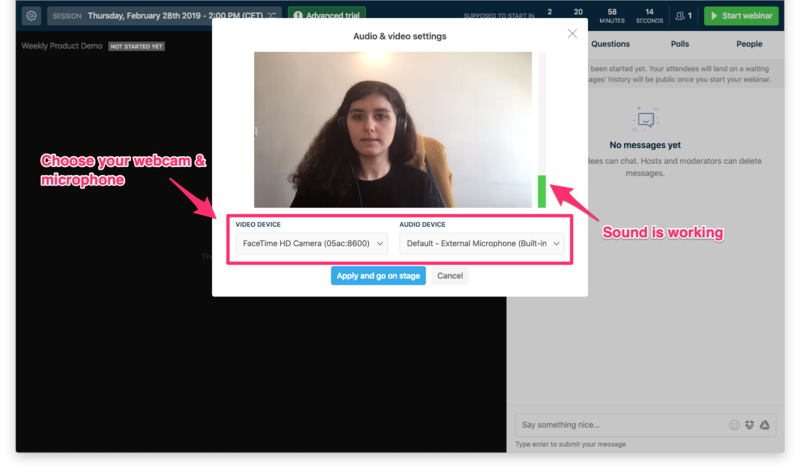 Your audio, video and screen sharing will also be recorded once you start your webinar. If the external device does not appear in the select menu, refresh the page first and open the device settings again. Your device should appear in the dropdown menu afterwards. 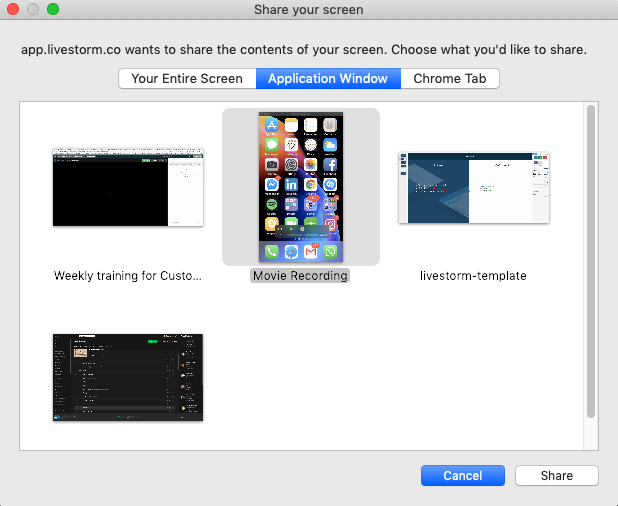 To use the screen sharing you have to use our Chrome extension. If the extension is not installed, we will display a notification pop up asking to download the extension. Once you have installed it, you don't need to reload the page, just click on the screen icon again (picture above). Starting from Chrome version 72, you don't need to download our extension. 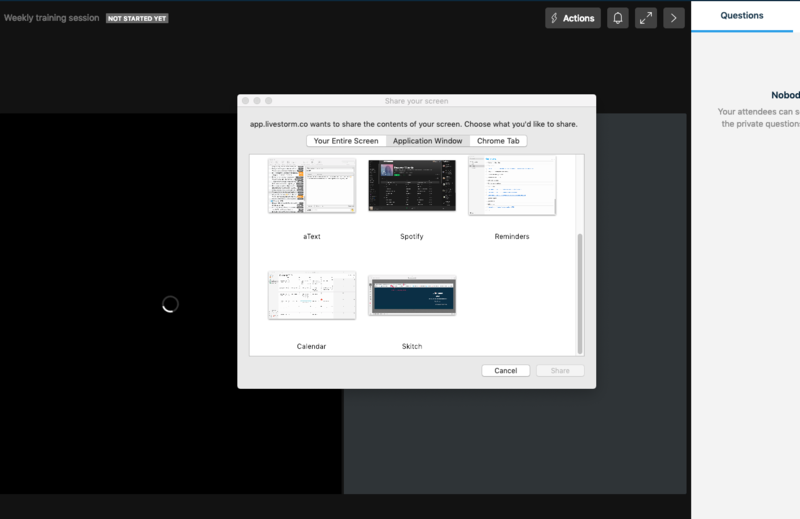 In addition, you can also share a single Chrome tab instead of an application window or your entire screen. You can then clear the blocked permission. Once removed, click on the screen share icon in your Dock again. This way, Firefox will ask you to give permission one more time. 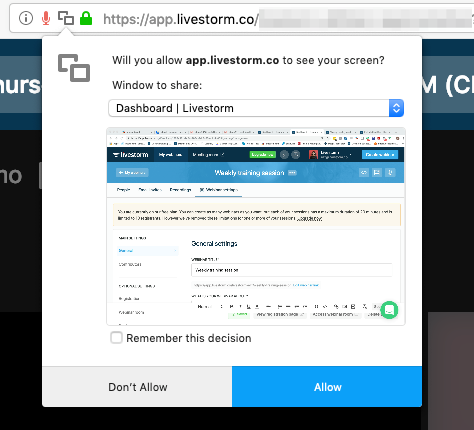 Click "Allow" and you'll be able to start your screen sharing afterwards. First you'll have to install Chrome Extensions for Opera. You can install the extension here. In order to learn how to properly share a presentation please refer to this tutorial. We cover every tip and trick to share a presentation with your attendees. How to share the screen of your mobile or tablet? 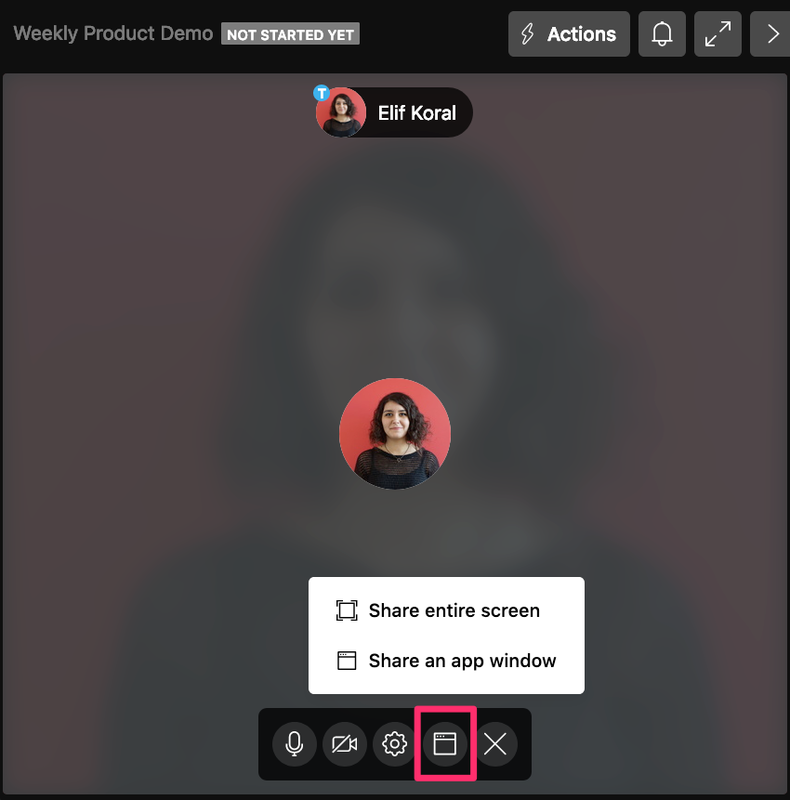 You can share the screen of your mobile or tablet in the webinar room. But first you'd need to mirror your device's screen to your computer. 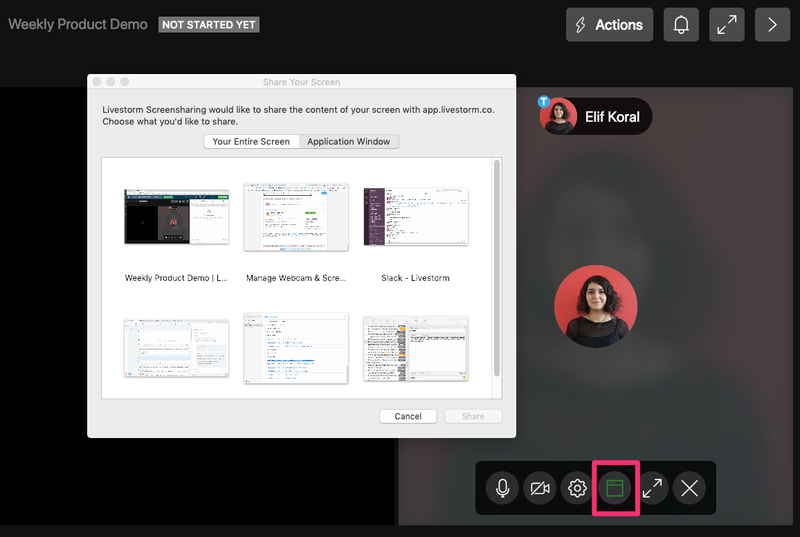 Once mirrored, you can use screen sharing to project your device's screen in the webinar room. 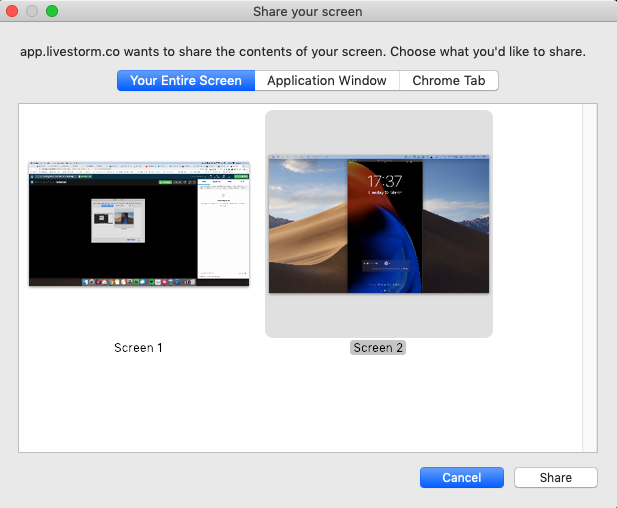 What Are the Best Practices When Sharing a Screen?